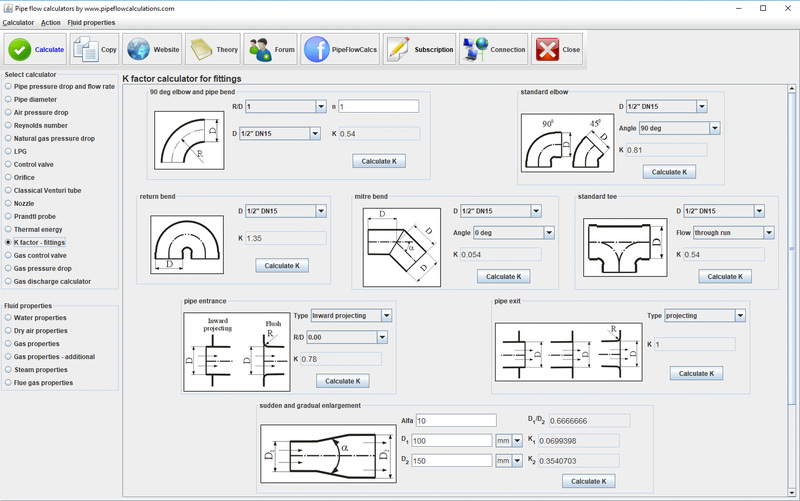 You can use the calculator for resistance coefficient (or resistance factor) K calculation of fittings. Resistance coefficient K is proportional coefficient between pressure drop (head loss) and square velocity of fluid flowing through valves and fittings like an elbow, bend, reducer, tee, pipe entrance, and pipe exit. With the resistance coefficient, K calculated, you can compute equivalent length l/d with pressure drop calculator, afterward. Resistance coefficient should be used with pressure drop calculator or with gas compressible flow calculator to calculate pressure drop in the piping system that includes obstructions like fittings and valves. The pressure loss due to resistance in valves and fittings are in a direct relationship with the diameter on which velocity occurs. Based on the size and shape of valves and fittings different values for resistance coefficient are computed.